“The Rocks Don’t Lie” by David Montgomery: Chapters 2 and 3 | J.W. 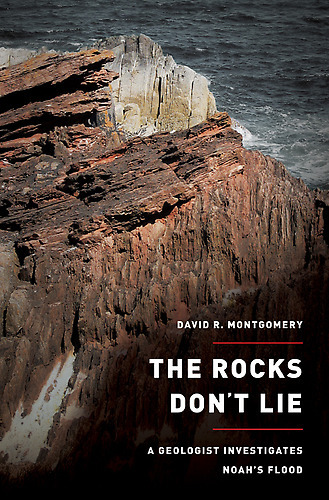 Wartick -"Always Have a Reason"
Here, I continue my look at The Rocks Don’t Lie by David Montgomery. I have not finished the book, but am rather writing these reviews as I read the chapters, so each one is fresh. Check out the end of the post for links to the other chapters as well as other related posts. David Montgomery notes this interest from young earth groups and so he dedicates a chapter to the topic. He uses his own exploration of the Canyon to lead into a discussion of the geological evidence. Some of the rock formations found there “require[d] both extreme heat and high pressure” to form (17). He turns to a brief explanation of radiometric dating: “…the age of a rock can be read like a geologic clock because radioactive isotopes decay at a fixed rate… If you know the half-life of an isotope–how long it takes for the remaining amount to decay–then the ratio of the parent-to-daughter isotope now in a rock tells you how long ago the rock crystallized” (17-18). Next, Montgomery gives a fairly basic introduction to geology. He provides a brief overview of how one can note unconformities in the rock and how different formations cut across each other. These evidences, found in the Grand Canyon, show that it was formed by a series of events rather than one single event (20ff). Moreover, physical evidence of fossilized burrows from “wormlike animals” in the sandstone provides evidence against flood geology. “How could fragile worms have been crawling around on and burrowing into the seafloor during a flood powerful enough to remodel the planet? The biblical flood would have had to have dumped more than ten feet of sediment every day for a whole year in order to have deposited the thousands of feet of sediment exposed in the canyon walls” (22). More evidence against flood geology is found in the way the sediments themselves were formed. First, the differing mass of types of silt, clay, sand etc. make it difficult to believe that they could have been mixed together in a flood and then been deposited with uniformity of layers. Second, layers like that of white sandstone are composed of “fine-scale features” which “would have been obliterated if they had formed underwater… These dunes were made by wind” (25). Finally, the fossils found within the Canyon present another difficulty. “If all the creatures buried… had been put there by the biblical flood, then why aren’t modern animals entombed among them? That the vast majority of fossils are extinct species presents a fundamental problem for anyone trying to argue that fossils were deposited by a flood from which Noah saved [at least] a pair of every living thing” (27). Montgomery has presented a number of extremely difficult problems for young earth interpretations of the Grand Canyon. In particular, the difficulty with the species of animals found buried seems intractable. My reason for noting this in particular is because flood geologists must assert that all the animal life is either descended from or prior to the animals in existence at the flood. Of course, if the Grand Canyon was formed by the flood, we should observe some of these extinct animals now–or at least recently. Yet for many, we do not. Why is that? A young earth perspective cannot simply assert that they died in the flood, for these would have been preserved in the flood. The other problems Montgomery noted may sometimes be dismissed by advocates of young earth theories. In particular, Montgomery does little to defend radiometric dating, which is itself a major target of young earth views. For those interested, Davis Young’s The Bible, Rocks and Time gives an extended defense of radiometric dating, and Young writes from a Christian perspective on this topic. Overall, this chapter presents a number of problems young earth advocates must deal with. Montgomery surveys briefly and selectively a history of Christian interpretation of the Genesis account and argues that some found room for less literal interpretations. Moreover, he points out that those who insist upon a literal reading of the text for Genesis must present reasons for not taking other references to the sky as a dome, etc. as non-literal (44-46, 50). Yet he also notes that the perspective from which the Bible is written (on earth) alleviates these difficulties–but these difficulties can only be alleviated by “allowing for figurative or allegorical interpretations” in which we “acknowledge… the fact that we live on a planet” (50). I have to say this chapter really surprised me, because Montgomery showed an appreciation for and interaction with Christian theology that I was not expecting. For just one example, he refused to set up the oft-rehearsed science-vs-religion rants that often accompanied discussions of Galileo. Instead, he explored the historical context, and noted that the ideas the church held were not necessitated by the text but were rather incorporated from Ptolemic ideas (49). The Rocks Don’t Lie continues to impress me. Montgomery is careful to avoid overstating his case. More importantly, he seems to genuinely respect the beliefs of those whose writings he surveys and he shows a true concern for accuracy regarding some of the controversies. Thus far, he has presented a number of significant scientific challenges to a young earth paradigm, as well as noting the change and variety of perspectives within theology. Be sure to follow the blog for the next chapter(s)! Check out my review of a similar work by a Christian: The Biblical Flood. I think this book is vastly important and should be in every Christian’s library. Be sure to browse my extensive writings on the “Origins Debate” over creationism, theistic evolutionism, and intelligent design (among other views) in Christianity. Source: David Montgomery, The Rocks Don’t Lie (New York: W.W. Norton & Company, 2012). I have this book on my shelf, and just haven’t had time to read it. But gee wiz, now that I’ve seen your review, I am going to have to read it.